Nicolas Maduro has said he's willing to meet with opposition leader Juan Guaido. With the military support crucial to his ability to hold on to power in Venezuela beginning to fracture, embattled Venezuelan president Nicolas Maduro on Saturday walked back his demand that American diplomats leave the country this weekend and instead extended that deadline to 30 days, a significant political concession. The longer time frame will allow for both the U.S. and Maduro's administration to keep diplomats at their embassies in Caracas and Washington D.C. to negotiate severing or downgrading diplomatic ties with each other. Maduro's new position was issued in a tweet on Saturday afternoon by Venezuelan Foreign Minister Jorge Arreaza. Meanwhile, opposition leader and now-interim president Juan Guaido on Saturday took to Twitter to triumphantly welcome the support of Venezuela's highest-ranking military diplomat, who broke from Maduro and urged other members of the country's armed forces to switch their allegiance to Guaido. Venezuela's news media is controlled by the Maduro administration, so Twitter is a potent way to get word out inside the country. Col. José Luis Silva, the military attache at the Venezuelan Embassy in Washington D.C. had said in a telephone interview from Washington, D.C. with el Nuevo Herald that he does "not recognize Mr. Nicolas Maduro as president of Venezuela." The el Nuevo Herald is the Spanish-language sister paper of the Miami Herald. “My message to all armed forces members, to everyone who carries a gun, is to please let’s not attack the people," Silva said, according to the newspaper. "We are also part of the people, and we’ve had enough of supporting a government that has betrayed the most basic principles and sold itself to other countries." Sources in Venezuela told ABC News that the military there is already split -- otherwise Guaido would be in custody. My message to all armed forces members, to everyone who carries a gun, is to please let’s not attack the people. We are also part of the people, and we’ve had enough of supporting a government that has betrayed the most basic principles and sold itself to other countries. Earlier Saturday, the impasse in Venezuela made its way to the United Nations. 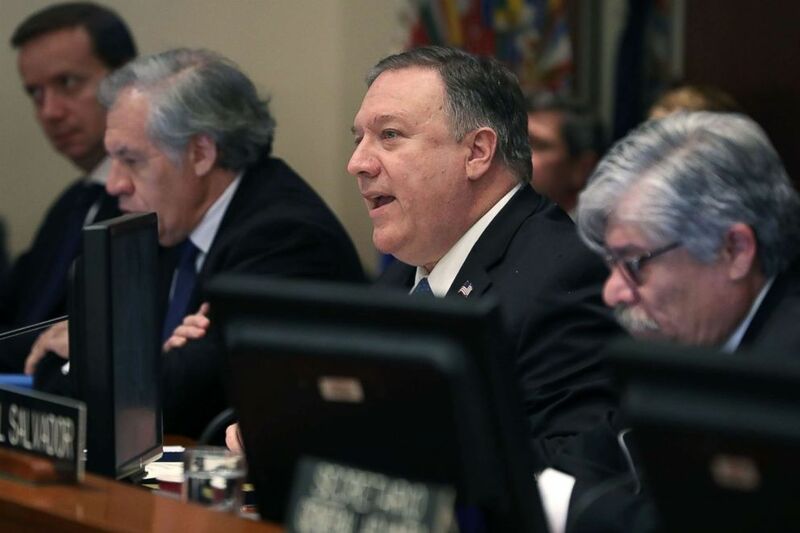 Arreaza and U.S. Secretary of State Mike Pompeo laid out their positions Saturday during a Security Council meeting, which was called by the United States and narrowly approved. The council's members include countries that have backed Guaido and countries that continue to support Maduro, The Associated Press reported. During his speech Saturday morning, Pompeo urged other nations to recognize Guaido. "Either you stand with the forces of freedom, or you're in league with Maduro and his mayhem," Pompeo said. Russia's ambassador to the U.N., Vassily Nebenzia, accused the U.S. of trying "to attempt a coup d'etat in the country." Germany, France and Spain said they would recognize Guaido if new elections are not held quickly in Venezuela. Both Spain and France said in their statements that new elections must be held within eight days, the AP reported. Maduro and Guaido gave dueling, defiant national addresses Friday that took place hours after a caravan of armored SUVs was seen leaving the American embassy in Caracas, as the deadline imposed by embattled Maduro for American diplomats to leave the country looms. A Reuters report also suggested that private military contractors were dispatched from Russia to help beef up Maduro's security team. More than two dozen people have died during protests this week, several organizations said, and as of Friday evening local time, 369 protesters had been detained since protests started Monday, according to Foro Penal, a local legal organization tracking arrests. The U.S. State Department yesterday ordered all "non-emergency" staff to leave Venezuela, but said the embassy would remain open at the request of the government of Guaido, whom American officials and several governments recognize as the legitimate president of Venezuela. 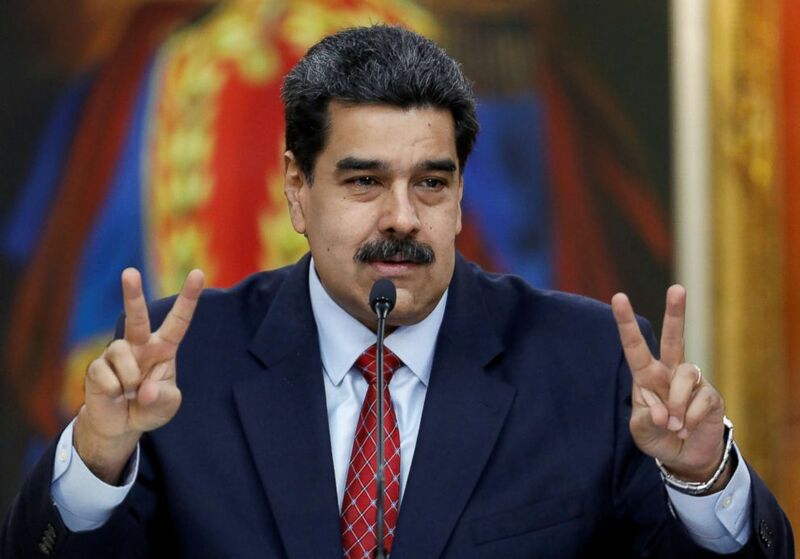 (Manaure Quintero/Reuters) Venezuela's President Nicolas Maduro gestures as he speaks during a news conference at Miraflores Palace in Caracas, Venezuela, Jan. 25, 2019. Those who want to see Maduro leave office are cheering Guaido's decision this week to swear himself in as interim president, a move supported by the U.S., Canada, Brazil and a handful of other countries. But others are calling the National Assembly president's move a coup d'etat. Both sides fear that the political conflict could spiral into widespread violence and perhaps even a civil war. Meanwhile, Reuters reported on Friday that private military contractors “who do secret work for Russia” have been dispatched to Venezuela to help beef up Maduro’s security team. We're getting ready with the military to defend Venezuela in any scenario that could take place. I have not abandoned power and I will not abandon it. Evgeny Shabaev, the leader of a paramilitary Cossack group with ties to the contractors, told ABC News that the contractors were military veterans who specialize in VIP protection, and that they had been flown into Caracas via Havana on the night Jan. 22, landing the same day that Guaido declared himself interim president. (Edilzon Gamez/Getty Images) Juan Guaido, who has appointed himself interim president waves to supporters at Plaza Bolivar of Chacao, Jan. 25, 2019 in Caracas, Venezuela. Shabaev said some of the contractors' relatives had told him the group could be as many as 400 men, flown on two flights. Other sources told Reuters that the numbers were much smaller. Brothers, I'm talking to you: the time is here, the time is here to work side by side with the constitution, the time is here to respect the people of Venezuela. Russian mercenaries have been appearing with increasing frequency around the world, most prominently in Syria but recently also in Africa, including in Central African Republic where they are believed to be guarding the country’s president. They’ve also been reported in Sudan and Gabon. Shabaev said he did not know who had hired the men for Venezuela. The contractors are often linked to a private company known as the Wagner Group, owned by an oligarch close to Putin. Experts believe the contractors are often hired for sensitive missions where the Kremlin prefers some deniability. In recent years Russia has invested billions of dollars in Venezuela, mostly as loans and military contracts, which Moscow now risks losing if Maduro falls from power. Maduro’s most recent visit to Moscow in December, he announced Russia would invest $5 billion in Venezuela’s oil industry and another $1 billion in its mining industry. As Pompeo prepared for a meeting with the United Nations Security Council, Maduro said he was planning to send his own foreign minister to New York. "We're getting ready with the military to defend Venezuela in any scenario that could take place," he said in a televised address. "I have not abandoned power and I will not abandon it." Venezuela's Minister of Defense and the head of the military said Thursday that they backed Maduro, while a former Venezuelan official told ABC News that there are growing concerns about the possibility of two warring factions forming within the military. Maduro also said he had received a request from rival Guaido asking for a meeting with government officials, and that he was willing to meet with him. 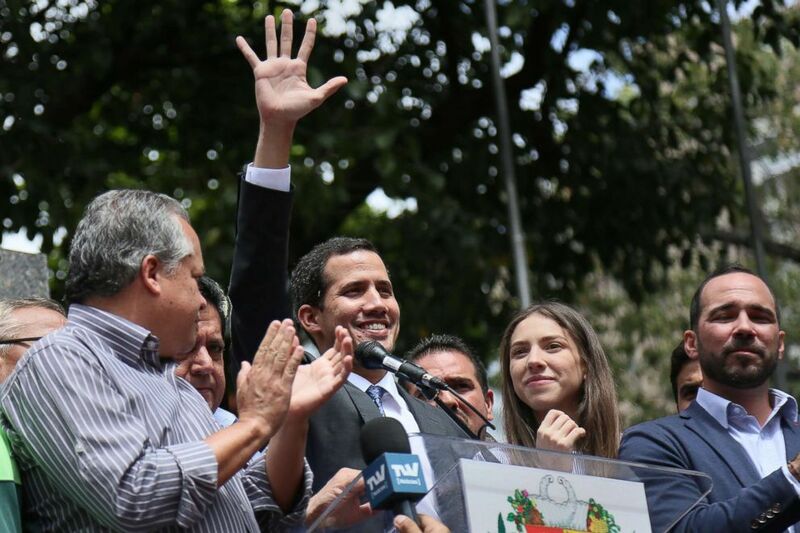 For his part, Guaido reaffirmed his commitment to offer amnesty to any and all military and government officials, soldiers and police officers who chose to support his interim government. Speaking to several hundred people at a public square in Caracas, Guaido -- who had not been seen in person since his swearing in Wednesday amid security concerns -- made direct appeals to the armed forces and asked them to join what he calls the "only legitimate government" in Venezuela. "Brothers, I'm talking to you: the time is here, the time is here to work side by side with the constitution, the time is here to respect the people of Venezuela," he said, as hundreds yelled chants calling Guaido president and Maduro an "usurper." Guaido added that his government is making moves towards ensuring that the Maduro regime can't access the country's financial assets, from which Guaido claimed Maduro has been pilfering. Hours later, the Department of State signaled the U.S. would start taking economic measures against the Maduro government to make American economic policies "consistent" with the government's recognition of Guaido as Venezuela's leader. "The United States will use its economic and diplomatic tools to ensure that commercial transactions by the Venezuelan Government, including those involving its state-owned enterprises and international reserves, are consistent with this recognition," State Department officials said in a statement. We know it’s not easy, but we’ll keep on going until we win. We know that the hope that started today in the hearts of millions of Venezuelans is not because of one person, it’s because of the firm belief that we can have a better country. In mid-December, Guaido slipped across the lawless border with Colombia to brief leaders there on his opposition strategy of widespread demonstrations in Venezuela set to coincide with Maduro's swearing in for a second term, earlier this month, the Associated Press reported on Friday. Guaido took the hidden route into Colombia to sidestep immigration officials, who reportedly sometimes harass opposition leaders or prevent them from international travel. Guaido also traveled quietly to Washington D.C. and Brazil last month for the same purposes, according to the AP. Saying that Venezuela has finally "woken up" from the nightmare it's been living in for two decades now, Guaido said his movements will stay on the streets until they can guarantee a transitional government and free elections. Under the Venezuelan constitution, Guaido's government has 30 days from the moment he was sworn in to hold presidential elections in the country. During his speech today, he said the international community's recognition of his interim government implies a certain degree of trust that he will get the country on the road back to democracy. Humanitarian aid -- he said -- was the first step toward helping Venezuelans distressed by the country's current economic crisis. “In just two days we achieved what [the Maduro government] couldn’t do in six years -– authorizing the entry of humanitarian assistance," he said, referring to the $20 million in aid Pompeo pledged yesterday. Guaido claimed he's been in communications with other countries to get more help. Still, the 35-year-old politician remains realistic about the risks of moving forward with his agenda in a country where dissidents are consistently imprisoned or exiled. ABC News' Conor Finnegan, Kaelyn Forde, Kirit Radia and Ben Gittleson contributed to this report.